bookstores were meeting places and informal universities where people discussed politics and social issues as well as literature. And some of the most important bookstores have been run by women including Elizabeth Peabody. We have no picture of Elizabeth Peabody as a young woman, although she was well-known in Boston. As her biographer, Megan Marshall, explains, Elizabeth’s portrait was painted in 1828 by Chester Harding, a well-known portrait artist in Boston. Elizabeth was 24 years old at the time and teaching at a school she had started for girls. Instead of being pleased by the portrait, her parents were scandalized. Women of that time did not have pictures of themselves hung on walls and displayed to others. Unlike men, women were supposed to live lives that were private and hidden from everyone except their families. Despite the prevailing customs, however, Elizabeth was destined to become a well-known and beloved figure in Boston and elsewhere during her long life. The portrait, incidentally, was destroyed years later in a warehouse fire so the only existing pictures show Elizabeth as an elderly woman. Elizabeth was one of three Peabody sisters—the other two were Mary, who married Horace Mann, and Sophia, who became the wife of Nathanial Hawthorne. All three were born in the early 1800s and lived through most of that eventful century, but Elizabeth had the most lasting influence and left a legacy that is still with us. 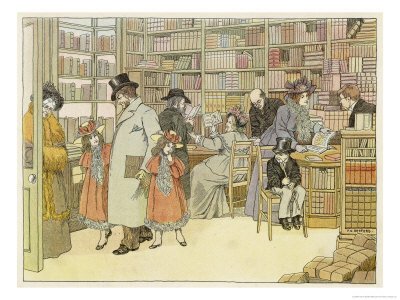 But to return to the bookstore…in 1839 Elizabeth opened a small circulating library and bookstore in the family home. She knew Ralph Waldo Emerson and many of his friends who were interested in expanding the intellectual horizons for Americans. They were eager to learn about the new ideas being talked about in Europe and Elizabeth’s bookstore offered them a chance to read and discuss European journals and new books. Not only that, Elizabeth also opened a small publishing operation and published several articles and books written by members of the group including several of Nathanial Hawthorne’s early stories. She was probably the first woman publisher in the United States. Elizabeth Peabody’s small bookstore in West Street was the place where the new Transcendental Club held meetings. Margaret Fuller offered her “Conversations” in the bookstore for the wives and friends of the Emerson circle. Elizabeth’s bookstore appears in my mystery story A Death in Utopia as a place where the Charlotte Edgerton and her friend Daniel Gallagher can follow up ideas for solving a mysterious death. 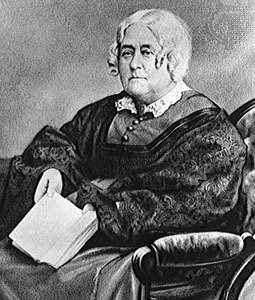 Running a bookstore and being a publisher were not Elizabeth Peabody’s only occupations. Later in life she opened the first kindergarten in America and her most lasting legacy remains the revolution in teaching young children which grew out of the kindergarten movement. Megan Marshall’s biography The Peabody Sisters; Three Women Who Ignited American Romanticism gives a good start on learning about Elizabeth and her accomplished sisters. My kind of woman! Thanks for the informative read! dear Adele, thank you for the introduction to Elizabeth Peabody, she was previously unknown to me. anybody who recognizes the importance of early education impresses me. Thanks, I’m glad you enjoy reading about Elizabeth Peabody. She was quite a woman! Great post! I agree with Laura – thanks for profiling and humanizing these figures/ Ms. Peabody sounds like a real character! Thanks, Alicia. I agree Ms. Peabody was quite a character. There is a story that when she was 85 years old she met Ralph Waldo Emerson one day and told him that she was beginning to study Chinese because she thought that would be a good language to learn. She never gave up. And I admire that. Wonderful post! I love the way you’re able to bring to life women who have been forgotten by many but SHOULDN’T be forgotten by anybody! You make me eager to learn more about Elizabeth Peabody.